Here at the Fresh farm we can't get enough halloumi. We love the "squeak" when you sink your teeth into a slice. It seems we're not alone either - Britain now consumes more of this cheese than anywhere outside its native Cyprus. We're sure you'll find tonight's dinner somewthing to squeak about! Preheat your oven to 210 degrees. Cut the butternut squash in half lengthways (no need to peel!) and scoop out the seeds with a spoon. Slice each half, widthways into wedges 1cm thick. Pop the wedges onto a large baking tray and drizzle on a glug of oil, a pinch of salt and the smoked paprika. Mix well, rubbing all the flavours into the flesh of the squash. Roast on the top shelf of your oven until soft and golden, 30-35 mins. Turn halfway through cooking. Meanwhile, chop the broccoli down into small florets (small trees). Remove the seeds from the red chilli and finely chop the flesh. Roughly chop the parsley (stalks and all) and walnuts. Cut each block of halloumi into eight slices. Keep to one side. Mix the walnuts with the honey, a pinch of chilli and the parsley. Give it a quick taste to check for seasoning and add a pinch of salt and pepper if necessary. We will spoon this over the halloumi when it is cooked. Put the broccoli on a baking tray and drizzle over some oil, a pinch of salt and black pepper. When the butternut squash has been cooking for 20 mins, put the brocoli in your oven to roast for the remaining 15 mins. Heat a drizzle of oil in a frying pan on medium high heat. Add the halloumi slices. Cook until golden, 2-3 mins on each side. Tip: The halloumi needs to be golden brown so don't overcrowd the pan, cook in batches if necessary. When all the halloumi is cooked, remove to a plate. Add the honey and walnut mix to your pan and warm through to melt the honey. 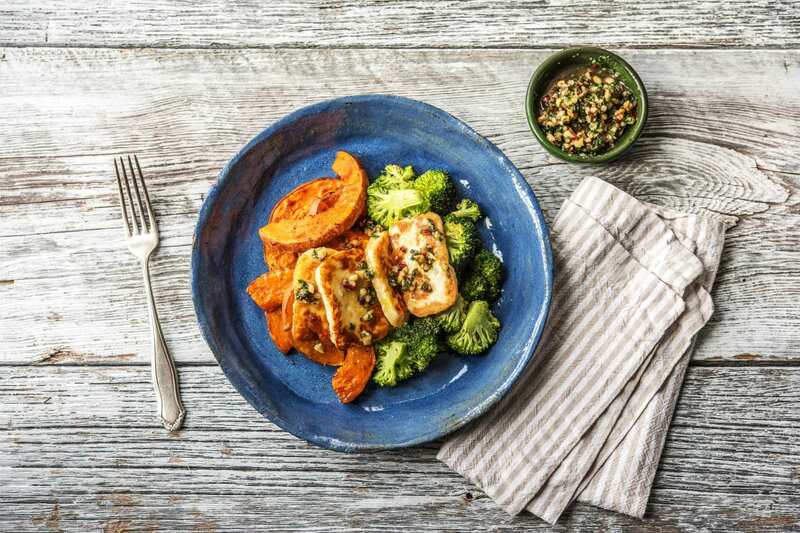 Arrange the butternut wedges and broccoli on your plate. Top with the halloumi slices and drizzle over the warmed honey and walnut dressing. Yum!